Gary Bauer is a Christian Zionist leader and a former GOP presidential candidate who has helped lead several far-right “pro-Israel” groups, including American Values, CUFI Action Fund, and Keep Israel Safe. Also a longtime supporter of neoconservative advocacy campaigns, Bauer has a track record advocating militarist U.S. foreign policies in the Middle East as well as right-wing domestic programs and social policies. Among his other notable affiliations, Bauer was a supporter of the Project for the New American Century, president of the Family Research Council, advisor to the Foundation for the Defense of Democracy, and a member of the Council for National Policy. Since the 9/11 attacks, Bauer has been a vociferous advocate of an aggressive “war on terror,” supporting neoconservative-led advocacy campaigns like the Project for the New American Century and using outlets like the Weekly Standard and Human Events to attack war critics and press for expanding the anti-terror campaign. Bauer has helped launch two “astroturf” groups since the election of President Barack Obama that have worked to push the administration to adopt hawkish Mideast policies, including taking a hard line on Iran and accepting the right-wing policies of Israel’s Likud-led government. One group, Keep Israel Safe, launched an ad campaign in April 2010 that accused the Obama administration of “coddling” Iran, appeasing terrorists, and not being a friend of Israel. The group, which as of early 2012 appeared to be defunct, was ajoint project of Bauer and Tom Rose, the former publisher of the Jerusalem Post and a contributing editor at the Weekly Standard. Bauer joined Kristol and other right-wing figures to found the Emergency Committee for Israel (ECI) in mid-2010. ECI is a Washington-based advocacy group that claims “to provide citizens with the facts they need to be sure that their public officials are supporting a strong U.S.-Israel relationship.” ECI’s first act was to run a controversial attack ad in Pennsylvania in July 2010 targeting the track record of Senate candidate Rep. Joe Sestak (D-PA), which insinuated that he supported Mideast terrorists. The group has also campaigned vigorously to get the United States to support military action to stop Iran’s alleged nuclear weapons program. The group’s board members and advisers have included Bauer and Kristol, as well as Rachel Abrams, wife of notorious Iran-Contra veteran Elliott Abrams; Noah Pollak, a neoconservative pundit who has worked for Commentary; and Michael Goldfarb, a former writer for the Weekly Standard who has worked as vice president of Randy Scheunemann’s lobbying firm Orion Strategies. Bauer justified his militarist advocacy efforts in a March 2005 interview with the Providence Journal, making the alarmist claim that "Islamofascism" was threatening western civilization. He said, "There is a need for Western civilization to confront this evil. The things they demand of us would require us to change who we are. … No politician is going to be able to ignore it. And no one is going to be able to say I will react to it as long as I can get France to go along." In 1997, Bauer joined a passel of neoconservative figures in Washington to create the Project for the New American Century (PNAC), an influential pressure group founded by Kristol and Robert Kagan, whose various sign-on letters and statements uncannily forecast—or influenced—the foreign policy course adopted by George W. Bush in the wake of 9/11. PNAC's founding statement of principles, issued in June 1997 with the signatures of a stellar cast of hardline Republicans and neoconservatives, argued that although a "Reaganite policy of military strength and moral clarity may not be fashionable today … it is necessary if the United States is to build on the successes of this past century and to ensure our security and our greatness in the next." Bauer also serves on the Board of Advisers of the Foundation for the Defense of Democracies, a neoconservative outfit founded by former New York Times correspondent Clifford May shortly after 9/11 that claims to be "dedicated exclusively to promoting pluralism, defending democratic values, and fighting the ideologies that drive terrorism." In July 2015, CUFI announced at its annual national summit in Washington, D.C., the launching of a lobbying arm, CUFI Action Fund, to be directed by Bauer. "You can't just bomb Washington, D.C. three days per year. You have got to actually occupy territory,” said Bauer at the launch. Bauer claims that one aspect of CUFI Action’s mission is to defend “Judeo-Christian civilization,” in part because President Obama supposedly prefers to praise “Islamic civilization” instead. "I seldom hear anybody talk about Judeo-Christian civilization. The president gives us lectures all the time about the wonders of Islamic civilization … but I am not sure he has ever used the phrase 'Judeo-Christian civilization.' We believe that it exists. We believe that it has brought more liberty to more people than any other culture or government idea. CUFI Action will be very vocal in defending that civilization and the two pillars of it and we are going to be working on the increasing persecution of Christians and Jews taking place in Europe and anywhere where radical Islam is growing." A key early goal of CUFI Action was to lobby members of Congress to derail the Iran nuclear deal, which Bauer described as "biggest capitulation in the history of Western diplomacy." Bauer has also served on the board of the Jerusalem Summit, an Israel-based advocacy outfit that brings together evangelicals, neoconservatives, and hardline pro-Israel figures from across the globe in an effort to promote Likud Party-aligned views on Israeli security. Bauer has also led a number of right-wing organizations that focus on domestic politics and issues of supposed moral decay. 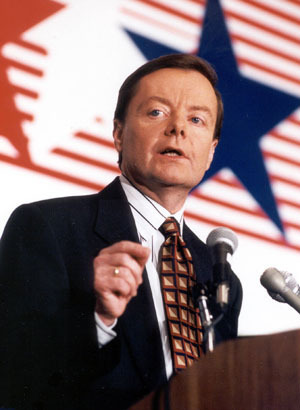 He is the former head of the Family Research Council (FRC) and in 1981 helped foundthe Council for National Policy along with a group of former members of the John Birch Society. When Bauer called his own press conference to combat the rumors of adultery, he refused to answer questions about which campaign he thought was spreading the rumors (although he had claimed a rival campaign was doing it), and whether or not any of his former colleagues had approached him about his seemingly inappropriate behavior with the female aide. When Bauer dropped out of the presidential race, he endorsed the campaign of Sen. John McCain (R-AZ), which drew criticism from conservative leaders. Reported People for the American Way, "On his 700 Club television show, Pat Robertson, who himself sought the GOP's presidential nomination in 1988, said, 'I don't think the Bauer thing makes one hill of difference. He didn't do anything anywhere all over the country. … I would think, frankly, that his political activity is pretty much over.'" American Values, http://www.ouramericanvalues.org; Campaign for Working Families, http://www.cwfpac.com/. Eli Clifton, “Bachmann: Muslim Brotherhood Has ‘Penetrated’ The U.S.Government,” Think Progress, June 22, 2012,http://thinkprogress.org/security/2012/06/22/504937/bachmann-muslim-brotherhood-penetration/. Robert Dreyfuss, “Michele Bachmann's McCarthyite Witch Hunt Against Muslims, 'Sharia Law,'” The Nation, July 23, 2012,http://www.thenation.com/blog/169001/michele-bachmanns-mccarthyite-witchhunt-against-muslims-sharia-law#. Letter cited in The Blaze, “Conservative Leaders Write Boehner Supporting Bachmann in Muslim Brotherhood Letters Controversy,” July 27, 2012,http://www.theblaze.com/stories/conservative-leaders-write-boehner-supporting-bachmann-in-muslim-brotherhood-letters-controversy/. Gary Bauer, “America’s Comeback Team,” Campaign for Working Families, August 11, 2012, http://www.cwfpac.com/eod/saturday-august-11-2012. Cited in Philip Burch, Reagan, Bush, and Right-Wing Politics: Elites, Think Tanks, Power, and Policy, Part A: The American Right Wing Takes Command: Key Executive Appointments, (Greenwich, Conn.: JAI Press, 1997). Eric Lichtblau and Mark Landler, "Hawks Steering Debate on How to Take on Iran,” New York Times, March 18, 2012,http://www.nytimes.com/2012/03/19/world/pro-israel-groups-differing-approaches-on-iran.html. Cited in Eli Clifton, “Israeli President Shimon Peres: ‘Under President Obama We Have The Best Relationship On The Issue Of Security,’” ThinkProgress, March 2, 2012,http://thinkprogress.org/security/2012/03/02/436166/peres-obama-security/. Eli Clifton, “The People Behind ‘Keep Israel Safe’ And ‘Stop Iran Now,” Inter Press Service, Lobelog, July 7, 2010, http://www.lobelog.com/the-people-behind-keep-israel-safe-and-stop-iran-now/. Eli Clifton, “Familiar Neocons And Christian Zionist Head Up New “Emergency Committee For Israel” Inter Press Service, Lobelog, July 13, 2010,http://www.lobelog.com/familiar-neocons-and-christian-zionist-head-up-new-emergency-committee-for-israel/. "Former Reagan Adviser Says U.S. Must Confront 'Islamo-Fascism,'" Providence Journal, March 23, 2005. Gary Bauer, "Strange Bed-Fellows: The Anti-War Left May Wind Up Helping President Bush," Weekly Standard, April 25, 2007,http://www.weeklystandard.com/Content/Public/Articles/000/000/013/539gpinz.asp. Edwin Black, "Christian Zionist group launches lobbying fund to oppose Iran pact," Jewish Telegraphic Agency, July 17, 2015,http://www.jta.org/2015/07/17/news-opinion/politics/christian-zionist-group-launches-partisan-lobbying-fund-to-oppose-iran-pact. 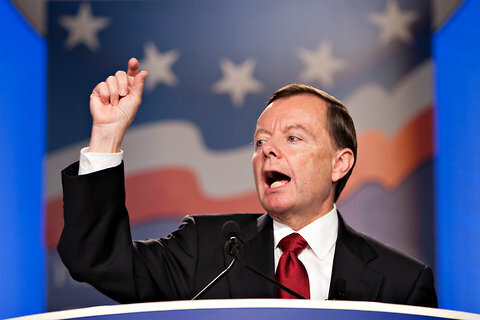 Samuel Smith, "America's Largest Pro-Israel Group Launches New Lobbying Effort Led by Gary Bauer, Urges Congress To Vote Against 'Stunningly Bad' Iran Nuke Deal (Interview)," CP Politics, July 23, 2015, http://www.christianpost.com/news/americas-largest-pro-israel-group-launches-super-pac-led-by-gary-bauer-urges-congress-to-vote-against-stunningly-bad-iran-nuke-deal-interview-141813/. Jennifer Harper, "Christians United for Israel draws 5,000 to Washington for summit, GOP hopefuls, some truth," The Washington Times, July 13, 2015,http://www.washingtontimes.com/news/2015/jul/13/inside-the-beltway-christians-united-for-israel-ar/?page=all. JP Updates, “Gary Bauer, Why I support Israel,” July 29, 2013, http://jpupdates.com/2013/07/29/gary-bauer-why-i-support-israel/. Jennifer Rubin, Get ready for the pro-Israel NRA,” The Washington Post, July 12, 2015, https://www.washingtonpost.com/blogs/right-turn/wp/2015/07/12/get-ready-for-the-pro-israel-nra/?postshare=8571436722924177. Tony Carnes, "Gary Bauer Can't Go Home Again," Christianity Today, February 7, 2000. "Bauer Denies Adultery Rumor," ABCNews.com, ABC News Internet Ventures, September 29, 1999. People for the American Way, "April: Gary Bauer, Vermont Civil Unions, and the Religious Right On the Air and On the Web," Right-Wing Watch Online, April 25, 2000. Josh Israel, “How Social Conservative Gary Bauer Uses His Network Of ‘Values’ Groups To Enrich Himself,” ThinkProgress, September 18, 2013,http://thinkprogress.org/lgbt/2013/09/18/2636571/gary-bauer-enriches/.